We are proud to offer plant and marine based skin care. The skin care lines we use are free of mineral oil, parabens, alcohol, lanolin, PABA, sodium laurylsulfate, artificial colors and dyes. The best of the best in facials we offer. This facial is customized to your skin and includes a deep cleansing followed by dermaplaning or microdermabrasion. We then infuse a nourishing booster, use micro current to tone facial muscles, apply a custom mask and finish with a decollete treatment. With the use of a micro needling pen, we create channels in the skin which trigger the skin’s own repair system. Collagen and elastin are stimulated and active ingredients penetrate better. This facial is for treating wrinkles, acne scars and can help repair hyper-pigmentation. Ask for more details about this amazing service. For all skin types except acne. Stem cell sources Comfrey and Argan visibly reduce lines and wrinkle depth, smooths skin surface and naturally repairs skin. This anti-aging treatment lavishes your skin with pure Caviar Extract, Pearl Extract, and a revolutionary blend of phyto extracts called Escutox. Improving wrinkles, elasticity, and texture, this luxurious facial increases skin oxygenation and suppleness while reducing signs of aging. Great for severely dry and pigmented skin. Restoring and moisturizing. This facial includes vitamin C and helps re-mineralize your skin through the use of seaweed. A must for tired, dehydrated skin. Recommended for dehydrated, oily, combination and mature skin types with dilated pores and/or skin imperfections. 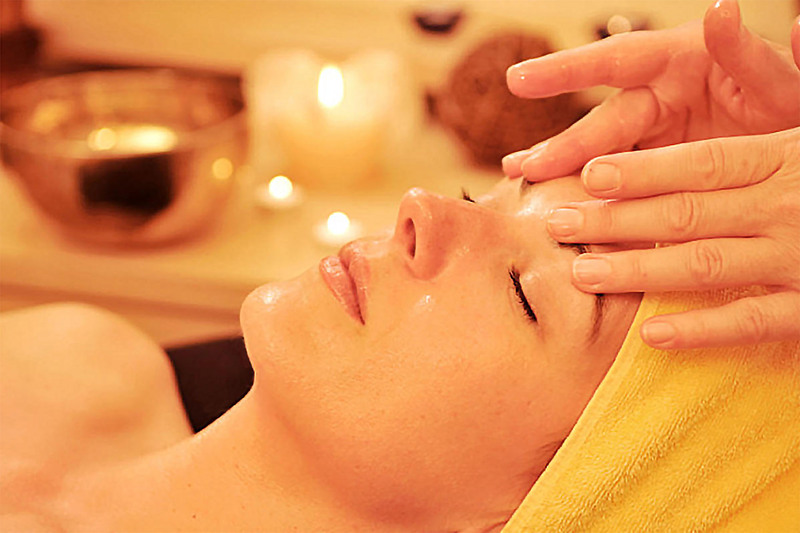 This facials helps to purge the pores of impurities, restore hydration and improve complexion. In this treatment we incorporate the use of micro current to help “exercise” the facial muscles resulting in a lifted and toned complexion. Dermaplaning is included. Dermaplaning is a simple and safe procedure for exfoliating the epidermis and ridding the skin of fine vellus hair (peach fuzz) with the use of a sterile scalpel. Brightens complexion and allows for better absorption of products. Price: $85/40min. | $112 with booster 55min. Refine pores, lightens dark spots, such as hyper-pigmentation and age spots, reduces fine lines and wrinkles and helps repair acne scars and superficial imperfections. These treatments produce immediate visible results. For all rosacea and sensitive skin types. This soothing and hydrating treatment brings visual relief and results to congestion and blotchiness through the healing ingredients of green tea leaves and chamomile. Includes dermaplaning. Similar to a Botanica Deep Cleansing Facial, but this is strictly for the back. Starts out with a deep cleansing, followed by steaming, exfoliating, extracting and finishing with a customized mask. Renders your skin ultra-luminous with a firmer, tighter and more youthfully defined appearance. Includes deep cleansing, exfoliation, steam and hydration enhancements as well as a facial massage with a rose quartz stone. Helps to tone and promote blood flow. This aggressive treatment works by having a strong peel applied to the skin resulting in the killing of bacteria and the drying of blemishes. Results are fast but more than one treatment may be necessary. Peeling occur and proper home care is a must. This classic offers exfoliation, steam, deep pore cleansing, facial massage, and a facial mask chosen by our skin care professional. We perform our Botanica Deep Cleansing Facial and add the healing benefits LED light therapy.This facial is not only deeply cleansing but helps to stimulate collagen and reduce inflammation. This unique facial is designed to re-hydrate, re-mineralize, and re-balance the skin with vitamins, minerals, amino acids and trace elements using seaweed – the main ingredient of the 4 Layer Facial. You will see instant brightening, tightening and lightening of the skin. Great for all skin types. Boosters can be added to many facials to enhance results.